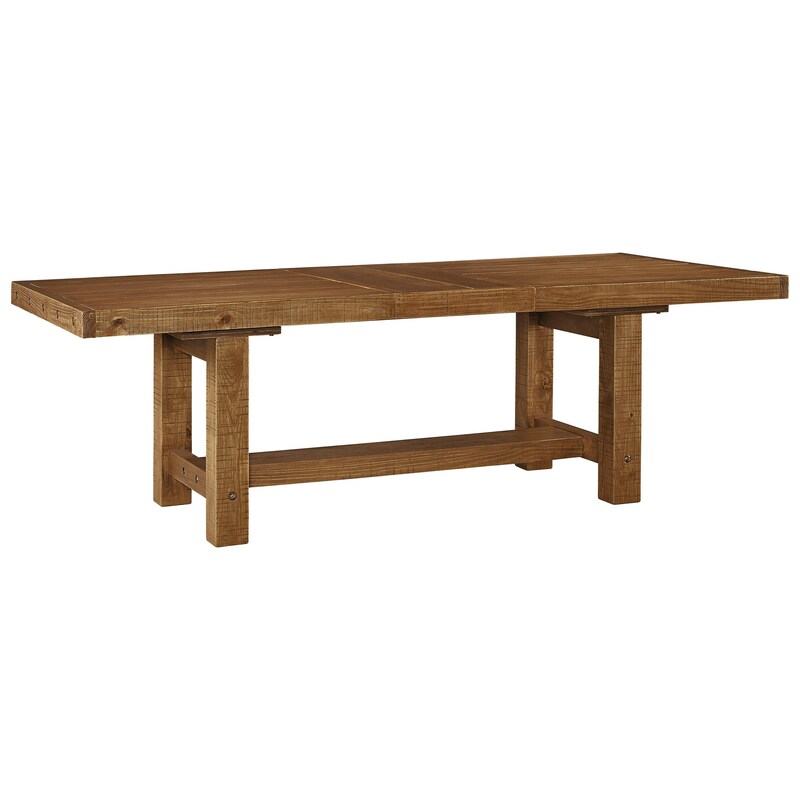 This rustic dining table is a beautiful centerpiece for your dining room. Crafted from pine solids with a brown honey tone finish, the table features pine veneers, wood distressing, aged-detailing and exposed-bolt heads that add an industrial touch. With an 18" leaf, this table expands to accommodate small family gatherings or large groups of friends. Displaying a trestle design to augment its simple yet elegant design, this dining table meets all expectations of style. The Tamilo Rectangle Dining Room Table with Leaf by Signature Design by Ashley at Household Furniture in the El Paso & Horizon City, TX area. Product availability may vary. Contact us for the most current availability on this product. Leaves One 18" leaf extends table from 72.12" to 90.12". The Tamilo collection presents beautiful furnishings designed for the modern dining setting. Featuring distressed wood, exposed bolts and a honey tone brown finish, these furnishings exude a rustic style with industrial accents. The collection, with numerous dining options and arrangements, strives to accommodate your family and friends. A casual collection that highlights rustic style, this timeless collection will transform your dining space. The Tamilo collection is a great option if you are looking for Relaxed Vintage furniture in the El Paso & Horizon City, TX area. Browse other items in the Tamilo collection from Household Furniture in the El Paso & Horizon City, TX area.